A 53 year-old male with 25 pack-year smoking history and occupational exposure to granite dust. Initial complaint of abdominal distention and moderate weight loss. He underwent an abdominal CT scan, which found an incidental nodule at the right lung base. 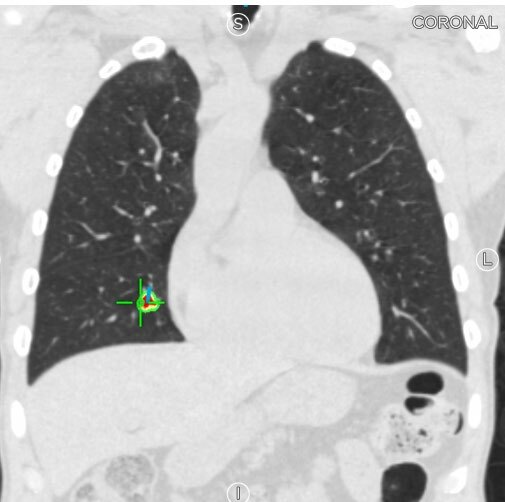 Patient was referred for a chest CT with contrast, which showed the nodule to be 1.1cm in the RML medial segment. The patient was then referred to Dr. Habib for pulmonary evaluation of the nodule. Dr. Habib recommended a PET scan due to patient’s smoking history. The PET scan was positive, so Dr. Habib and patient decided to move forward with a Navigated Bronchoscopy for biopsy. 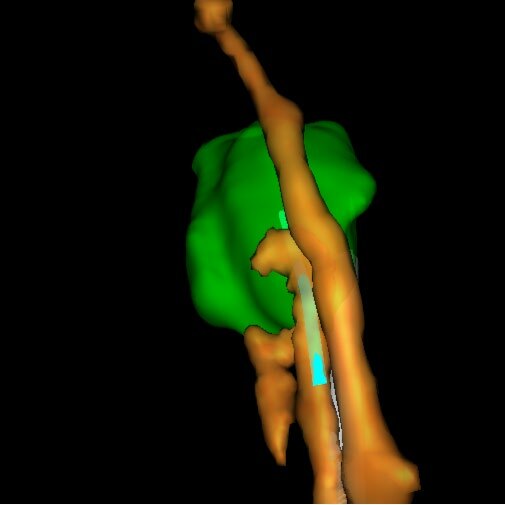 A vPad™ was placed, and the patient underwent the Veran inspiration/expiration CT scan protocol. This case demonstrated the importance of respiratory gating, with the 11mm RML nodule moving 26mm during respiration. 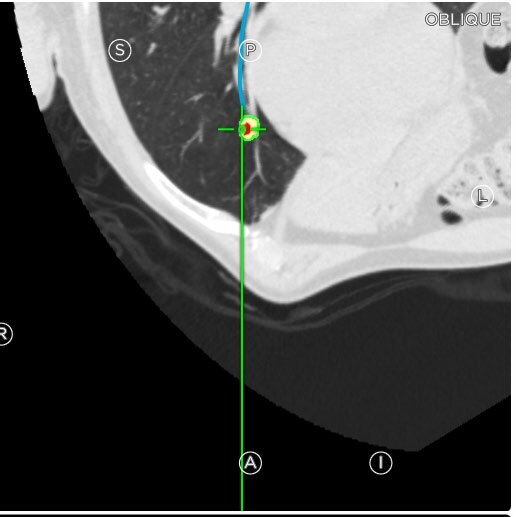 The 11mm nodule was automatically segmented using SPiN Planning™ software. The field generator was positioned over the vPad™, and the patient was automatically registered. Dr. Habib verified registration accuracy and then navigated out to the target. 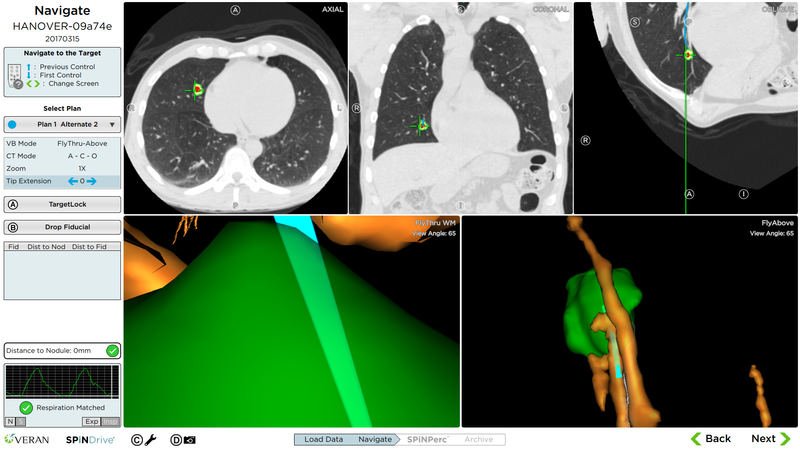 He was able to visualize the target endobronchially and advance his Always-On Tip Tracked® forceps to the nodule. The nodule would only turn green when expiration was matched. At all other points during the respiration cycle, the instrument did not appear to be in the nodule. This scenario explains the importance of respiratory gating and using it to sample at the time patient space matches image space. The patient was diagnosed with a stage N0 carcinoid tumor, referred for surgical resection, and is now cancer free.